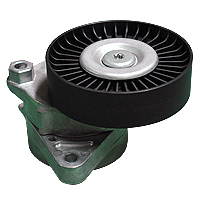 Belt Tensioners - Automatic Belt Tensioner(02) - Clutch Bearings Industries Co., Ltd. Clutch bearings is a professional Automatic Tensioner producer who also manufactures car equipment consists of wheel bearing hub, alternator pulley and etc. The item is often applied in various kinds of belt systems. As a significant part of the system, its high quality and performance must be glorious to get best performance. Generally you might want a special automatic tensioner to achieve the most effective efficiency of your design. Clutch provides not solely the prime quality item, but in addition the reliable service. You may discuss with our technicians to seek out the best product for you. Even you can not find the one which fit your request completely, Clutch additionally offers the service of personalized automatic tensioner. Every year the Clutch invests plenty of funds to research and develop all our products. With more and more selections launched, you could find what you want easily. Any time you want one to fulfill your calls for, just contact Clutch. Copyright © 2019 Clutch Bearings Industries Co., Ltd.